The Rolling Stone Lake picnic for 2018 is just about ready to open Sunday for a day of fun, music, games, food, drinks and more in northeastern Langlade County. 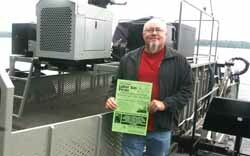 Dennis Giles, chairman of the Rolling Stone Lake Protection and Rehabilitation District, the group holding the picnic for decades, explained that it is an important fund raiser being held on a holiday weekend, allows all of the visits to northern Langlade County to have place to gather, visit and have fun. Held in the lake district building at East Shore and Pickerel Lake Road, which is east of Highway 55, the event is traditionally a busy spot with games, music by Don and Rosie from Lovin' Country, raffles and plenty to eat. A bake sale and rummage sale will open at the lake building at 8 a.m. on Friday and Saturday mornings. Giles, who has headed the district for four years, explained that it operates and aggressive summertime aquatic weed harvest program to improve the recreation opportunities on the lake. Dennis Giles, chairman of the lake rehabilitation district on the Rolling Stone weed harvester. “What we are doing is mowing the lake,” Giles explained, as the third generation of harvester takes tons of weeds from the waters each day. He figures that it easily removes 185,000 tons during a summer of running, which removes substantial nutrients from the waters. The harvester is run by volunteers, including Giles, and unloads at a landing at the end of East Shore Road. Giles explained that the current weed harvester is the largest the district has owned over the decades. He added that the picnic is not only fun, but it serves as a major fund-raiser and offers an opportunity for a giant get-together and opportunity to make new friends. “We invite everyone to come and have a good time,” Giles said. He assured the brats, burgers, and games of change will be underway at noon Sunday.